Proud to be partnered with Visallo who just keeps getting stronger and stronger!!! In this chapter, I want to overview the operational structure of Major Case Management. Many Commonwealth countries (and some larger US jurisdictions) define Major Case Management roles within what’s called a “Command Triangle”. Specifically, per the diagram below, jurisdictions within countries such as Great Britain, and Canada define three (3) primary roles – a Major Case Manager who is responsible for the effective governance of the investigation, a Primary Investigator who reports to the Major Case Manager, and a File Coordinator who is responsible for coordination for internal communication and case file management. As part of this Command Triangle, the Major Case Manager is accountable for the overall investigation. He or She determines investigation strategies, identifies and manages investigative resources, conducts case reviews, and all other high-level management functions. The Primary Investigator typically reports to the Major Case Manager and is responsible for tasks including preparation of the case file for status meetings, ensuring that assignments are completed in a timely fashion, identification of resources required for the investigation, and report any major case updates to the Major Case Manager. Also reporting to the Major Case Manager is the File Coordinator. Their job is also multi-faceted, and includes tasks such as scrutinizing the documents created during the process of the investigation to ensure the completeness and quality, ensuring that tips and leads are assigned and managed, ensuring the security of the case file(s), ensuring that all case actions are logged into the investigative case management software, and more. Within these three roles are any number of supervisors and line staff that perform interviews, collect evidence, communicate with the media, and so on. Not to beat a dead horse here, but I’ll point out again that all of these roles may be performed by just a few people in some jurisdictions. I believe in The Command Triangle model but also strongly support a more US-centric model – The Major Case Framework. Perhaps the differences are subtle, but a Triangle is a hard shape with defined lengths and known, predictable angles. A Framework, however, is just that – a frame which, by nature, allows for additional flexibility than a hard shape. A frame is designed to support a structure, not confine it. It’s this flexibility that makes the Major Case Framework ideally suited for the U.S. market. By that, I mean there are 200 or 300 law enforcement agencies in Canada, the majority of which have dozens or hundreds of officers. Down here, there are over 18,000 law enforcement agencies ranging in size from NYPD (More than 50,000 Officers) to Frenchtown, New Jersey (3 Officers). This type of variance requires the flexibility of a framework. So, what is the Major Case Framework? 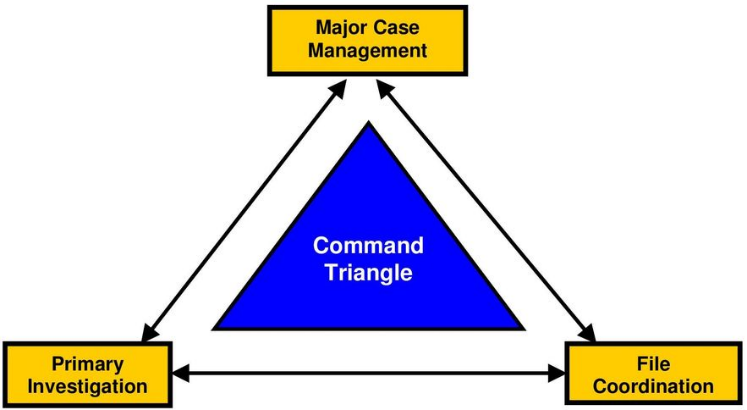 As noted in discussing The Command Triangle, managing major cases generally consists of organizational groups that perform different, but equally important, roles. 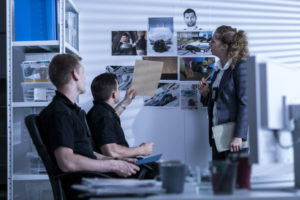 The Major Case Framework, however, better recognizes the true nature of investigations by acknowledging from the outset that many, and sometimes all, of the roles are performed by only a small number of individuals and that role flexibility is part of day to day investigation work. Command: Personnel who establish standard operating procedures, guidelines, and policies, along with the direction that ensures departmental compliance with mandates and laws. The responsibility for the specific directions that a MCM Team takes falls into the hands of those in the Command role. Some examples of Command roles include Chiefs of Police, Sheriffs, Task Force Commanders, and Commissioners. Command Staff: Personnel who are charged with the high-level implementation of the policies driven by those in the Command role. CID unit heads, divisional Captains, and task force Directors are examples of the roles that fall into this group. Supervisor: Personnel who manage, control, and direct the actual resources of the MCM Team. There are any number of ranks that fill this important role, including Lieutenants and Sergeants, but – in general – the Supervisor is the individual who holds responsibility for the actual control of the personnel involved in the daily activities of the investigation. Line/Support: Personnel who perform the day to day tasks related to the investigation. These are the Detectives, Investigators, Technicians, Deputies, Analysts, and a host of other titles that are working the investigation at the ground level. The success of this organizational group. 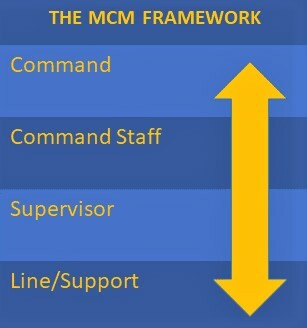 As noted in the MCM Framework diagram, in many organizations ‘Commanders’ will find themselves performing Line/Support functions, and Supervisors will often find themselves doing the roles defined in ‘Command Staff’. American Law Enforcement, particularly small and medium-sized agencies and task forces, require the flexibility of the framework in order to succeed. It is important that any agency’s case management systems and processes allow for the flexibility of both the Command Triangle and the Command Framework. Douglas Wood is CEO of Crime Technology Solutions | Case Closed Software, a leading provider of serious investigation software to law enforcement, state bureaus, DA offices, and other investigative units. Doug can be reached directly HERE. In Part One of this series, I overviewed a generally-accepted definition of Major Cases, and discussed some of the attributes that define them. In Part Two, I began to probe the ‘types’ of Major Cases – specifically, Single-Incident Major Cases. These are cases that may, under different circumstances, not be Major Cases but for the identity of the victim, the identity of the suspect, the location of the incident, and/or the uniqueness of the crime. Mass Crimes – A Major Case mass crime involves multiple victims at one location during one continuous period of time, whether it is done within a few minutes or over a period of days. 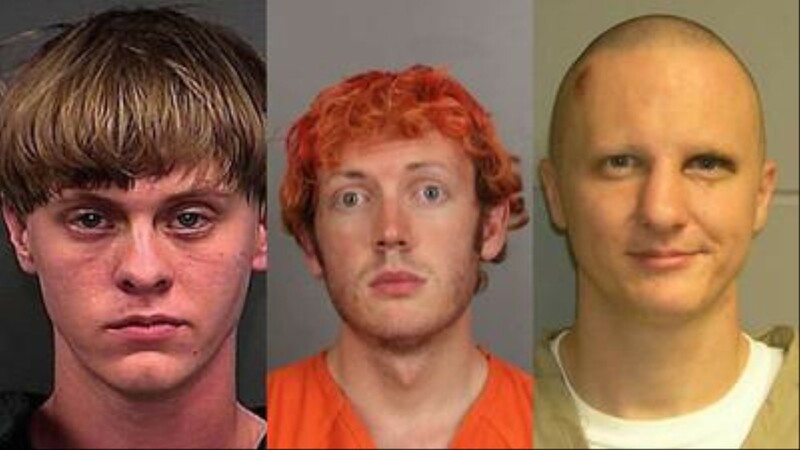 The term ‘mass murder’ springs to mind, and invokes images of Dylann Roof(Emanuel African Methodist Episcopal Church in South Carolina), James Holmes (2012 Aurora, CO. shooting in which he killed 12 people and injured 70 others at a movie theater), and James Loughner (2011 Tuscon, AZ shooting that killed 6 people and severely wounded US Representative Gabrielle Giffords). There are other types of Major Case mass crimes, however, including mass assault, mass human smuggling, and other horrible crimes that need no further illustration here. Spree Crimes – Spree criminals commit two or more serious crimes with two or more victims, but at more than one location. An important distinction about spree crimes is that there is no ‘cooling off’ period between the crimes. An unfortunate example of a spree crime is that of Mark Barton. 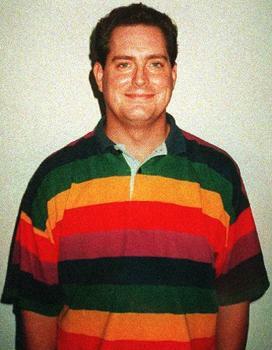 On July 29th, 1999, he walked into his office at Momentum Securities and opened fire, killing four people. Then he went next door to another company and killed five more people. Earlier in the day he had also murdered his wife and their two children. Multiple crimes in multiple locations with no cooling off. Another example of a spree crime is the armed robber who hits a slew of pre-chosen banks on the same day, terrorizing employees in the process. The examples here are too numerous to mention, but they become Major Cases by virtue of their spree qualities. Again, this shows multiple crimes in multiple locations with no cooling off. Serial Crimes – Serial criminals commit multiple crimes with multiple victims. Unlike spree criminals, however, serial criminals commit their crimes on distinctly separate occasions. There is a cooling off period between crimes. 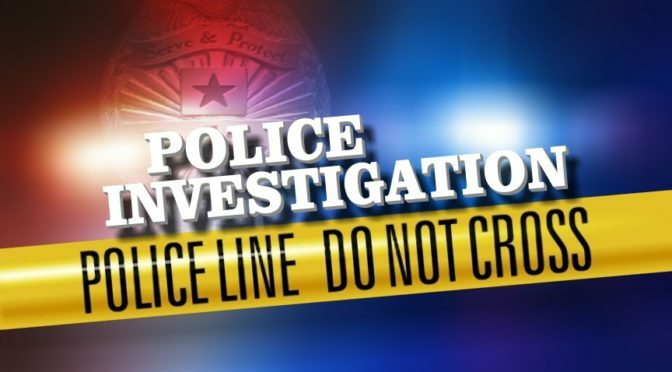 The major problem for law enforcement investigating Multiple Incident Major Cases, especially those that fall in the ‘serial’ category, is that new crimes are committed even as the investigation is underway. Resources can be stretched to their thinnest when a new crime is added to the serial list, and the public pressure for an arrest can overwhelm even the hardest of investigators. Hello, stress. A common attribute of the successful serial crime investigators that I have spoken with is their ability to separate the pressure from the work. The crimes and their timing are unpredictable, the public demand for a resolution is powerfully serious, and ‘interested parties’ (think politicians) are breathing down the investigators’ necks. That’s a lot of pressure. Taking time to partake in leisure and family. In Part 4 of this special series Managing Major Cases, I will examine the operational structures involved in managing major investigations. Managing Major Cases Part Two: What puts the ‘Major’ in Major Cases? In Part One of this series, I provided my definition of Major Cases and went into some detail about some of the attributes that differentiate a Case from a Major Case. Moving ahead now, I want to take a look at the different ‘types’ of Major Cases. One of the problems in dealing with Major Cases is that, because of the varying types of cases, there’s no firm blueprint for investigating them. Major Cases move in real time, and – based upon interviews I have conducted with Major Case Investigators – can generally fall into one of two categories – Single Incidents and Multiple (serial) Incidents. This article tackles Single Incident Major Cases. The identity of the victim: In September of 1996, at the height of tensions between The Bloods and The Crips, a 25 year old African American man is shot in a drive-by shooting on the streets of Las Vegas and dies a few days later. Unfortunately, young black men die far too frequently in times of gang tensions, and few of these cases ever elevate to the status of a Major Case. The victim here, however, was Tupac Shakur. 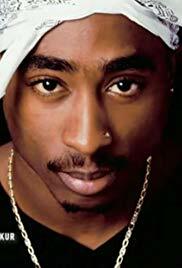 Tupac was an American rapper and actor who came to embody the 1990s gangsta-rap aesthetic, and was a key figure in the feud between West Coast and East Coast hip hop artists. Simply put… he was famous as hell. Hence, a far-too-routine shooting became a Major Case in the blink of an eye. The case remains unsolved. 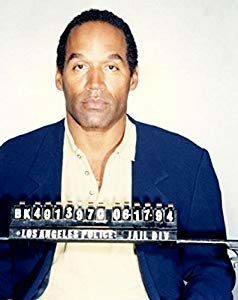 The identity of the suspect(s): “We the jury in the above entitled action find the defendant, Orenthal James Simpson, not guilty of the crime of murder.” Thus ended the double murder trial of former NFL player and Heisman Award winner OJ Simpson. In what was deemed ‘The Trial of the Century”, Simpson had been charged with the June 13, 1994 killings of his ex-wife Nicole Brown Simpson, and her friend Ron Goldman. After weeks of testimony, and a clear nation-wide division between those who believed Simpson to be innocent and those who believed him guilty, Simpson was acquitted of the murders on October 3, 1995. While the case of two relatively young and affluent Caucasians being killed in the generally safe area of Brentwood may have been newsworthy, it was the identity of the suspect that was the catalyst in this becoming one of the most famous single-incident Major Cases in American history. 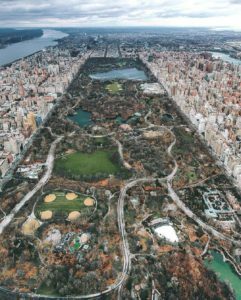 The location of the crime: When a half-naked corpse, covered in cuts, bruises and bite marks, is found behind the Metropolitan Museum of Art in New York’s Central Park, you have the makings of a Major Case. The corpse was that of 18-year-old Jennifer Dawn Levin. Levin was murdered during the early morning hours of August 26, 1986. The ‘Met’, as the museum is known, is one of the most-visited and famous museums on the entire planet. Murders don’t happen in world-famous places like this, and the case became the top story on the evening news for months and months. That is one major single-incident Major Case. The uniqueness of the crime itself: Six year old girls in upscale Colorado neighborhoods aren’t supposed to die. They’re certainly not supposed to be murdered… especially in their own home while the rest of the family slept. 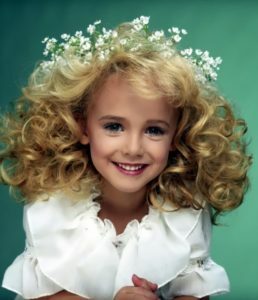 Uniqueness has always surrounded the December, 1996 killing of young beauty queen JonBenét Ramsey in Boulder, CO. Tragically, it’s estimated that over 1500 children are murdered each year in America. JonBenét’s case may have been just another number in that truly sad statistic were it not for unique circumstances that surrounded it; it occurred in an upscale neighborhood, the victim was a young beauty queen, the ransom note matching the bonus, a possible crime scene contamination by father John, and ‘seemingly’ uncooperative parents that made this a single-incident Major Case. In Part Three of this series, we examine some examples and problems associated with Multiple Incident Major Cases. This is Part 1 of a series dedicated to the science (and art) of managing Major Criminal Cases in law enforcement. In order to begin a discussion on this subject, though, it’s important to define what makes an investigation a Major Case Investigation in the first place. Irrespective of how your own definition may vary from Chief Dan’s, this much is simple; Major Cases are serious criminal matters. The degree of ‘seriousness’, however, is almost entirely relative. A stabbing in Chicago may not, by itself, be ‘serious’ as viewed by the public at large. Conversely, a sexual assault on a small University Campus may be extremely ‘serious’. Make no mistake… neither are good or acceptable, and both are, of course, unthinkable violations. The point here is that cases may be Major Cases (or not) by virtue of the relative socio-economic environment in which they are being investigated. Attributes of a Major Case. You probably have a Major Case when..
Resource Requirements – The amount of resources that an investigation unit must devote to a Major Case is substantial… far more than the average investigative case. This would include additional officers, overtime, forensics work, and the like. If your budget is shot in one fell swoop… you probably have a Major Case on your hands. Big Brother is Watching – Maybe the Mayor is involved. Maybe the ACLU. Black Lives Matter? The NRA, even. Major Cases are often associated with major non-law enforcement interest from groups claiming to be stakeholders. If Al Sharpton, Wayne LaPierre, or AG Jeff Sessions have chimed in… you probably have a Major Case on your hands. All Hands on Deck – Major Cases tend to redefine titles and organizational roles. Many of the Chiefs and Sheriffs I have interviewed on this topic describe pulling all types of duty assignments. Patrol officers become Detectives, who become Media Relations, and so on. If the chief cook is washing bottles… you probably have a Major Case on your hands. 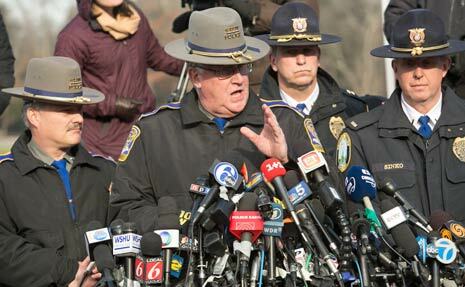 Media Attention – Many Major Cases capture the attention of the public and, subsequently, the media. In many cases, a local case can turn viral and suddenly there’s a CNN mobile satellite truck parked outside. What makes an investigation viral isn’t always clear, but it’s discussed HERE in some detail. If Wolf Blitzer calls your investigation ‘Breaking News’… you probably have a Major Case on your hands. There are Multiple Jurisdictions Involved – Because of the possible complexities of Major Cases, they quite often involve multiple agencies. 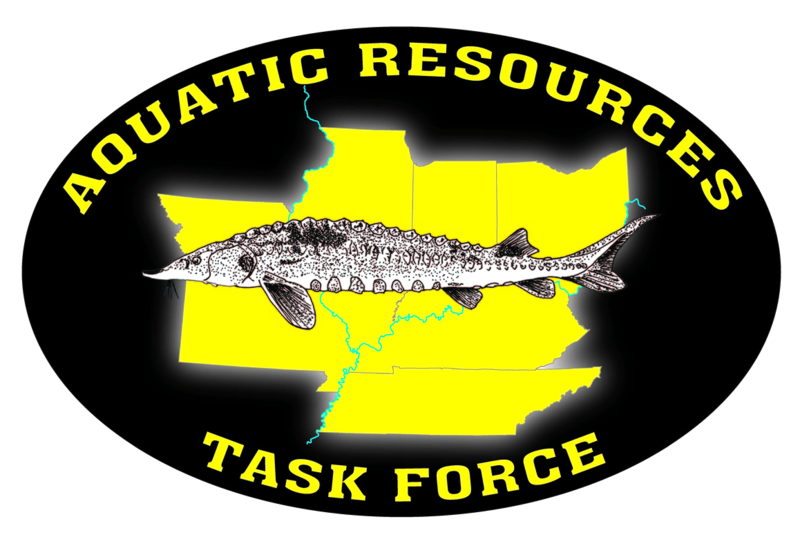 Task Forces are regularly utilized in Major Cases, and are comprised of any number of people from across different law enforcement agencies, making the problem of staying organized even harder. Perhaps the City PD is working to support the local Sheriff’s Office – or vice versa. Maybe the State Bureau of Investigation is involved. Maybe the FBI. If you need ‘Hello My Name Is…” stickers during your case review… you probably have a Major Case on your hands. Having placed some parameters around what defines a Major Case, we will look deeper into the unique problems associated with these types of investigations. Stay tuned for Part Two of this series. As we have noted in previous posts, “The Cloud” is one of those terms that seem intimidating to the uninitiated. You hear about it all the time, yet many people aren’t quite sure what it is, exactly. This misunderstanding of technology is seen in all sorts of environments, from business to law enforcement. 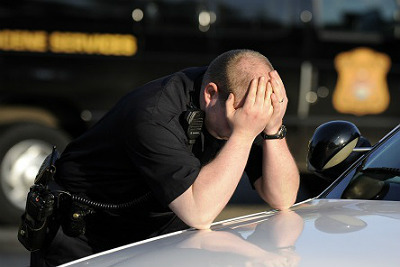 This is especially unfortunate in the world of law enforcement because using cloud-based solutions can enhance productivity, foster better communication between agencies, and reduce operating costs. Simply put, law enforcement must adapt to this internet-based technology or be left in the 20th century. Traditionally, police data has been kept in separate hubs referred to as “siloes”. Each type of task a law enforcement officer performs may require accessing data from a different silo. For example, a detective may need to access arrest records and phone records from two different places. 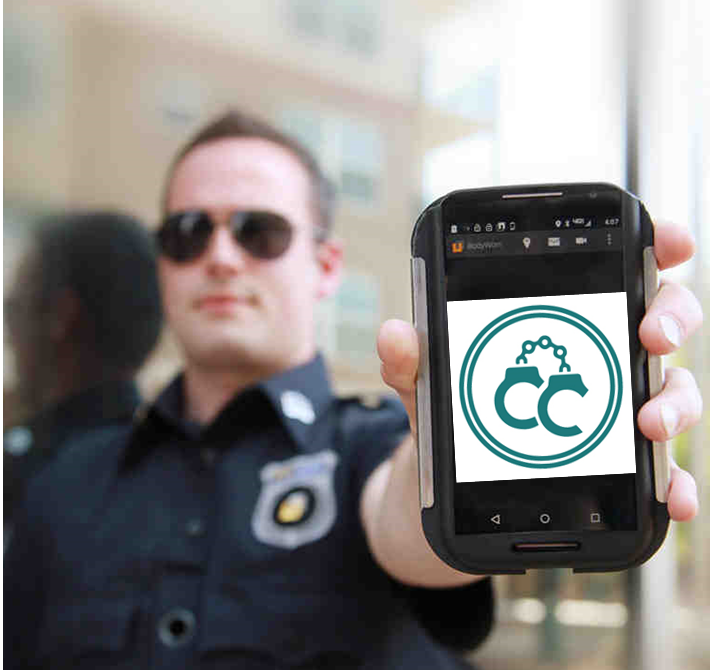 With cloud-based solutions, police can access or submit data from any device that is linked to a single central hub. This cuts out a ton of unnecessary clerical work and leaves law enforcement with more time and resources to actually enforce the law. 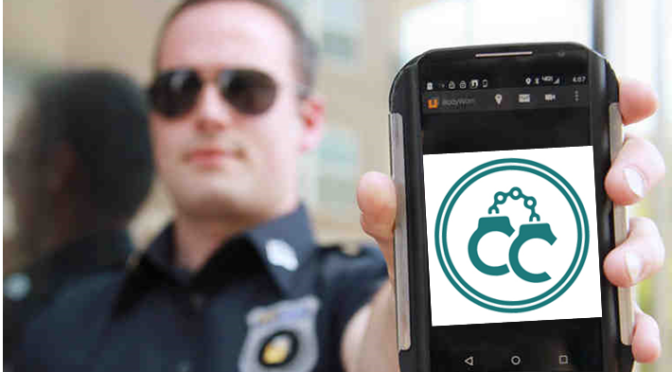 Accessing crucial data from mobile devices allows officers to be more situationally aware as well, which increases officer safety. 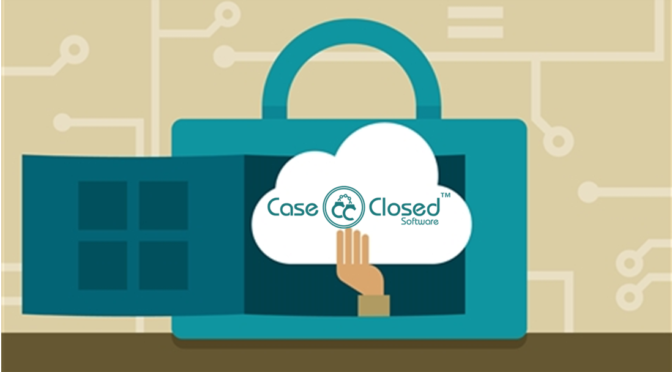 Additionally, rather than hosting their own servers and maintaining physical records of data, agencies can spend just a fraction of the cost for access to servers hosted off-site, in the cloud, without forfeiting any ease of access. 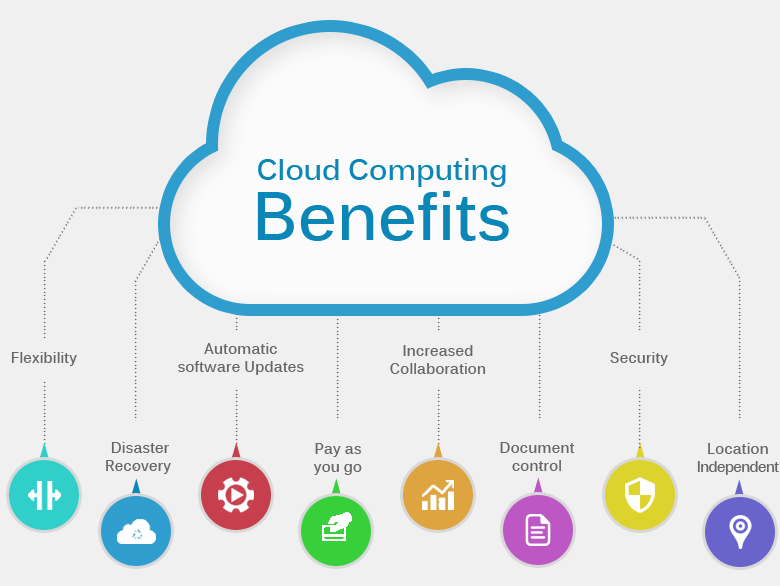 The cloud is also becoming less cost prohibitive. Cloud services are not only becoming less expensive, but the ability to pay for only the data that is used is an advantage for agencies that previously had to guess how much bandwidth or server space they would need. Additionally, ease of access to security updates keeps vital information secure from malicious hackers who would access the data for nefarious purposes. 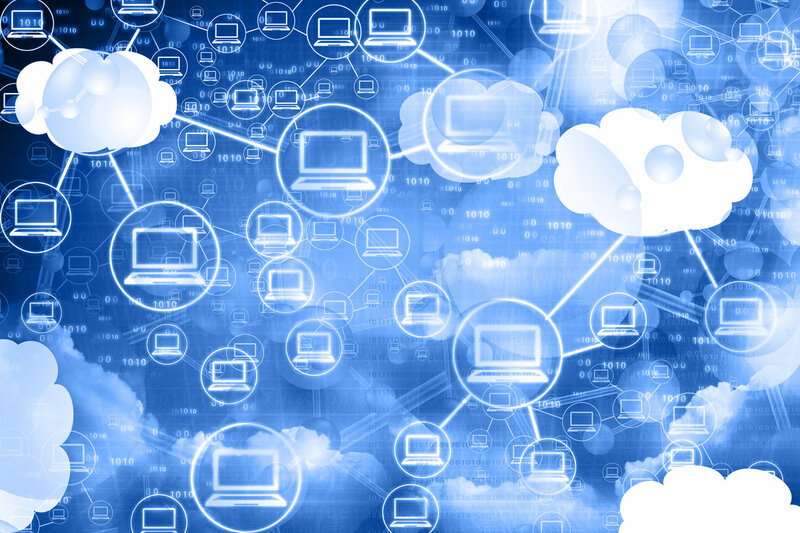 The cloud is the obvious solution for data storage in the 21st century. From business to law enforcement, organizations that utilize the cloud can be sure there are clear skies ahead. 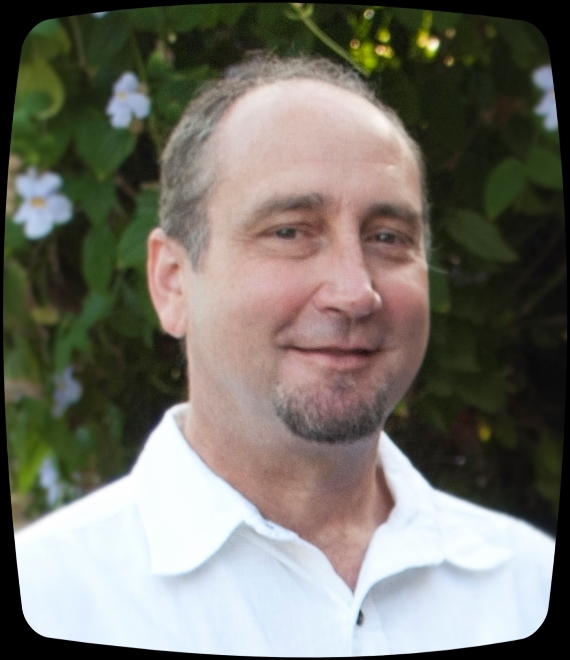 Douglas Wood is CEO of Crime Technology Solutions, LLC and Case Closed Software, a provider of on-premise and cloud-based investigation software for law enforcement and other investigative agencies.